The homage to Beatrix Potter's mischievous bunny and his chums is beautifully presented, the appearance setting a standard that the taste more than matches. Adults are served on a two-tier garden stand, while younger diners receive their treats in a wooden vegetable box, the results charmingly rustic rather than rough-and-ready. The gorgeous, airy Victorian conservatory setting is dotted with foliage and although it's not completely bucolic — buses still chug past on Piccadilly right below — it's a relaxed and friendly environment for an endearing experience. Only two finger sandwiches per person may seem meagre, but they're the only mediocre offering in a magnificent meal (and offer a safe start for fussier diners). The tangy smoked salmon and tomato swirl is an inventive way of serving the afternoon tea staple — and may provide a way for parents of fish-naysayers to slip it past their kids. Those deliciously moreish veggies form the 'Mr McGregor's Garden' part of the meal, a mini baguette stuffed with cauliflower, carrots, radish and other vegetables. A red pepper hummus adds a splash of pizzazz to what could have been a very dull dish, and the fresh-baked bread is a delight. Those rabbits knew what they were doing when they raided Mr McGregor's veggie patch. The scones are standard afternoon tea fare, tipped into charming territory by the presentation of the jam and cream in teeny tiny terracotta pots. 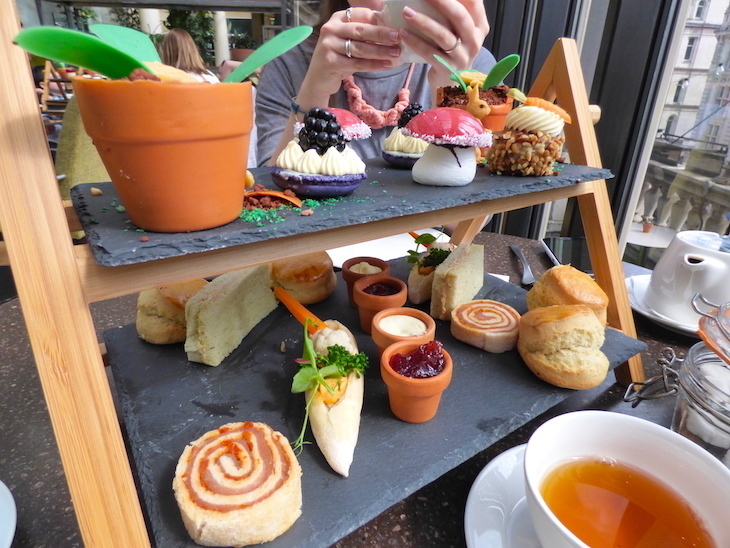 The pots are not edible, our waitress is at pains to tell us, an odd comment until we find out that the sweet 'flower pot hide-out' on the next tier is edible. 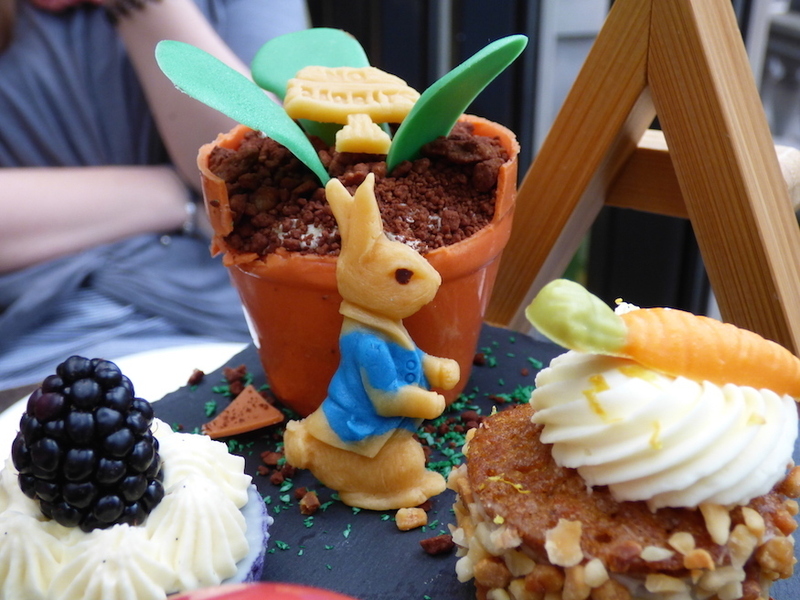 The chocolate plant pot contains a sweet mousse — if you can't quite put your finger on that taste, it's chamomile — and chocolate 'mud', and is topped off with an extremely cute marzipan Peter Rabbit. It's the peak of the afternoon tea. 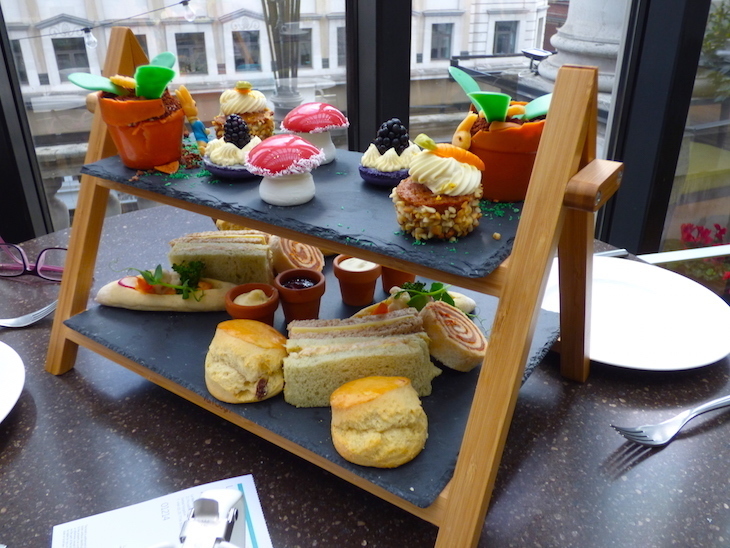 Heck, it's the peak of any afternoon tea we've had in London, and that's not a title we bestow lightly. The rest of the sweet treats — carrot cake, a strawberry ganache and meringue mushroom, and a blackberry open macaron — each offer a unique flavour, and avoid the trap that many afternoon teas befall of teetering from the sweet to the sickly. Whether you've got kids, or you're a big kid yourself (yeah, us too), it's refreshing to feel we've filled up on veggies rather than E-numbers for a change. 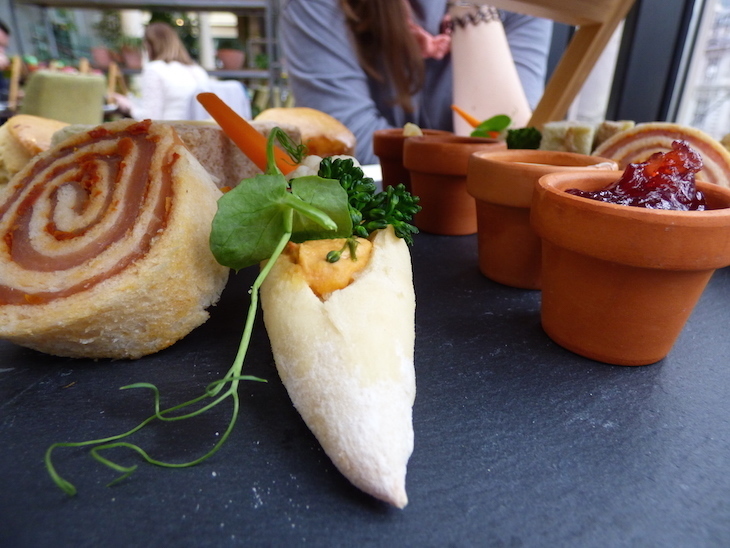 Peter Rabbit Afternoon Tea at The Terrace on Piccadilly inside Le Méridien Piccadilly. £35 per adult/£25 per child, advance booking required. Available seven days a week, 12.30pm-5pm, until September 2019.